Our product range includes a wide range of waiting chair - powder coated and waiting chairs. We have been counted as a major firm offering high performing Waiting Room Chairs. Avail now the most stylish and highly viable range of waiting chairs from us. These robust quality chairs withstand the rugged handling at waiting rooms and demanded widely for its warp resistant fabrication that is done from premium quality aluminum. Further, these chairs are designed with a robust grade beam to support the load and are accessible from us at a leading price. With the skills of our highly experienced professionals, we are instrumental in developing high-quality Waiting Chairs. 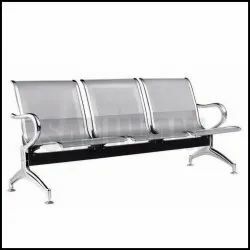 These chairs are demanded widely for its unmatched quality and cost-effective performance that works best for public places. Designed especially for waiting rooms these chairs offer ease of cleaning and minimal maintenance requirements. Further, we are providing the warp resistant chairs in 1, 2 and 3 seat pattern at a leading price.